It has been way too long since I’ve made something. I love making things and I think it’s important to be creative. But sometimes making things can be intimidating when you don’t really know what you are doing. Have no fear. I’ve found a bunch of Easy Painting Ideas that you can totally DIY. Why painting you might ask? Well, I have a subcription to Skillshare. Skillshare is an amazing online learning community with video classes on everything under the sun. I’ve taken an HTML class, two really, really good Photography classes and most recently I watched a great class on painting with Watercolors for beginners. So, I’ve been practicing what I’ve learned from Skillshare, especially the photography and the Watercolors. And I’d like to tackle an actual DIY painting project on a canvas that I can hopefully hang somewhere for people to ooh and ahh at. And now I’ve found some inspiration to practice my new found skills on. And, actually, rediscovered that I have done a bunch of very easy painting projects that are great for a beginner. 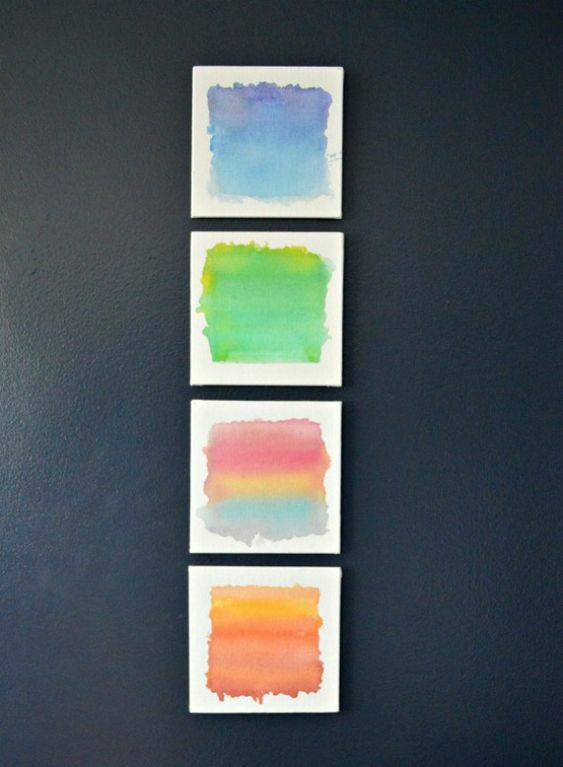 Almost all of these easy painting ideas are either made with watercolors or acrylics. Most of them are either done on watercolor paper or canvas. Check each tutorial for the type of brushes you use. The Skillshare tutorial I took recommended brushes made of squirrel hair. This simple tutorial for an absract acrylic from Birch and Button is perfect for a beginner who is a little nervous about messing around with paint. There’s nothing super fancy or expensive with this. 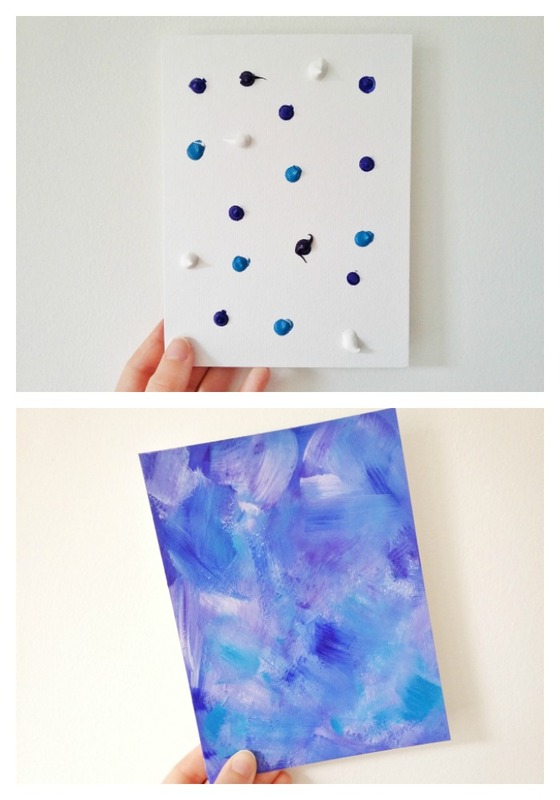 You can totally mess around with mixing colors and I love the idea of starting with dots of paint on the canvas. It takes away some of that “what do I do first? ?” anxiety. And Stacey has a really nicely written tutorial, so maybe give this a try? There’s barely anything to lose. 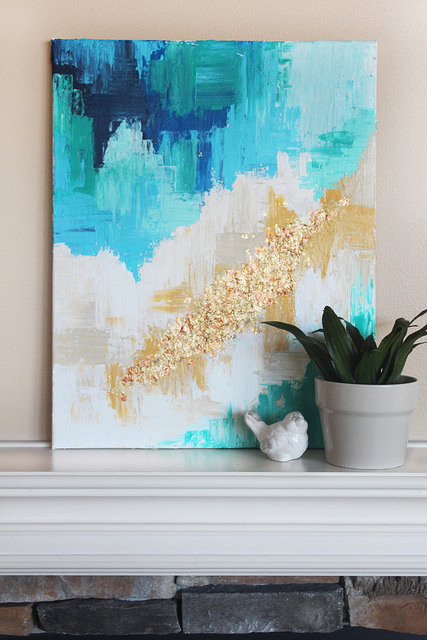 Okay, if you’re ready for something a tiny bit fancier and that takes a bit more skill, you should give this DIY Abstract Canvas from Lolly Jane a try. I love the touch of glamorous gold leaf in this one. I also love that this one has some texture to it, as well as some straight lines. And those straight lines, by the way, made by scraping with cardboard! This tutorial is great because it shares tips and tricks that the artist has picked up along the way. 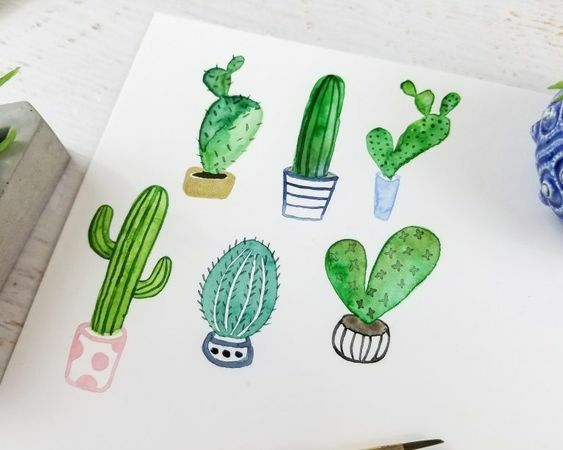 If abstract isn’t your thing, you should give these super cute watercolor cacti from Fox and Hazel a try! Watercolors are so fun and easy to play with and you can do this on watercolor paper rather than a canvas. I can totally see these being the type of thing you want to make again and again until you’ve got them just right. If you get a few of these just right, I think they would be adorable framed and hung in a bathroom. I don’t why in the bathroom. I just feel like that’s the room these would belong in. 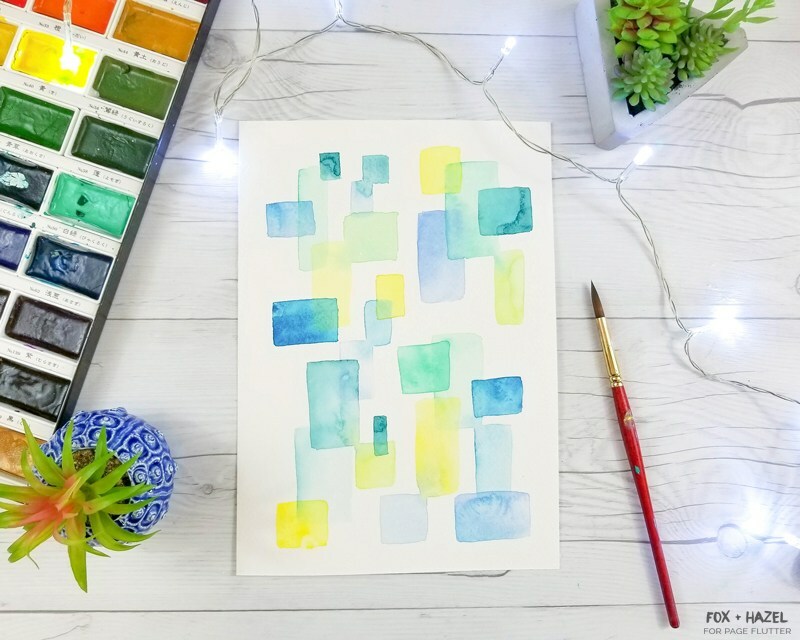 This pretty little abstract painting that you can find on Page Flutter, but created by Fox and Hazel, is probably what I’ll be trying out first. First, I love that it’s watercolor. That’s definitely what I’m into at the moment. I’m sure I’ll come back to some of these acrylic paintings at a later date, but right now it’s a watercolor obsession. The second thing I love about this is that the overlapping triangles. Not sure why. I just really like that look and the way that some of the colors blend when they meet. If you’re looking for something beachy, look no further. 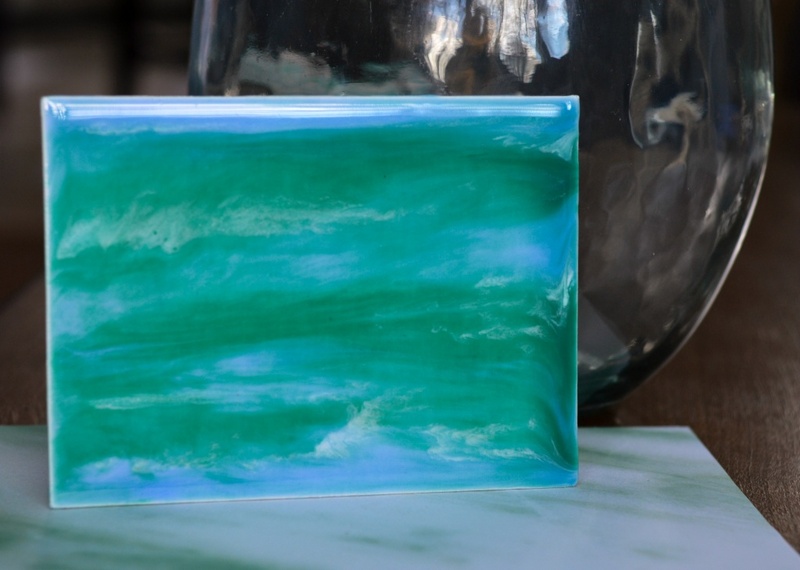 This DIY Ocean Scene from Darice has got you covered. I love the colors in this painting and it really is very simple to achieve with some acrylic paints, some brushes and a canvas. You could go small canvas and hang this in a cute little spot, or what about HUGE canvas and hang it behind the couch?? This feather totally caught my eye. I like feathers. It’s suddenly fall here in the Northeast and these colors are totally giving me the fall feels. (Fall is my favorite). 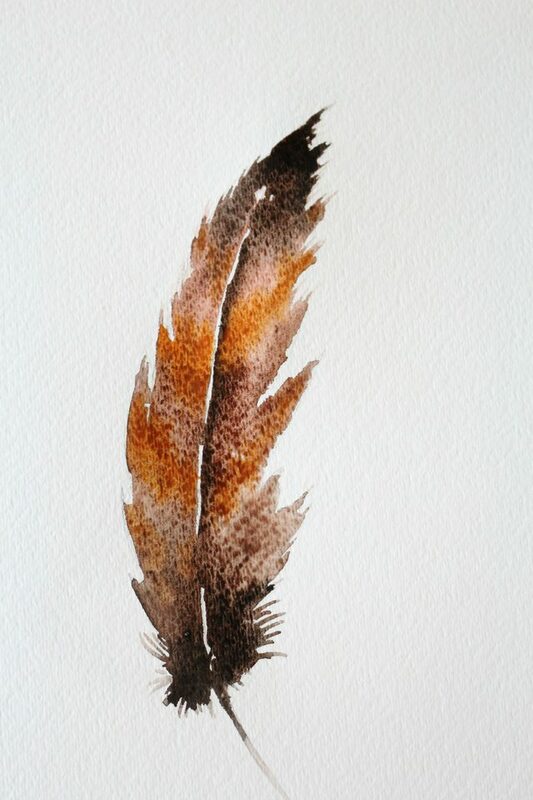 The best part of this feather tutorial, however, is the tutorial. It looks very easy and achievable. It’s also very similar to the final project from the Watercolor class I took on Skillshare. So, I feel like I could handle this, even thought it’s definitely a little more skilled than some of the more abstract paintings here. 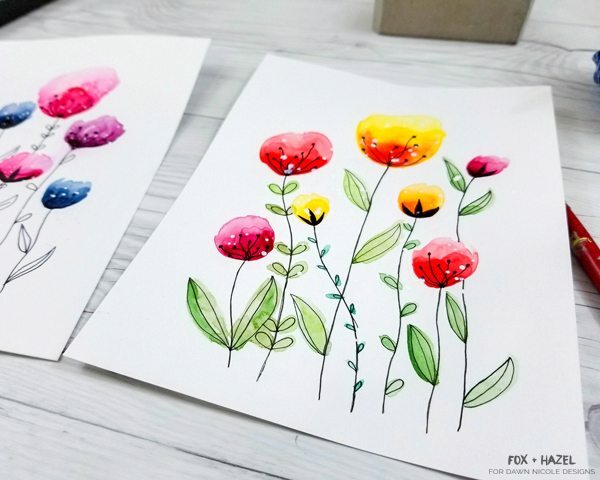 These whimsical little watercolor flowers by Fox and Hazel are so very pretty. I love that these are finished with the black pen outline. I think it takes what is really a very simple flower shape and gives it some structure and form. The step by step tutorial is on point here, too. This is definitely something that will not be difficult to achieve. You can do this. I think even I can do this. I have a confession. I don’t like ice cream. 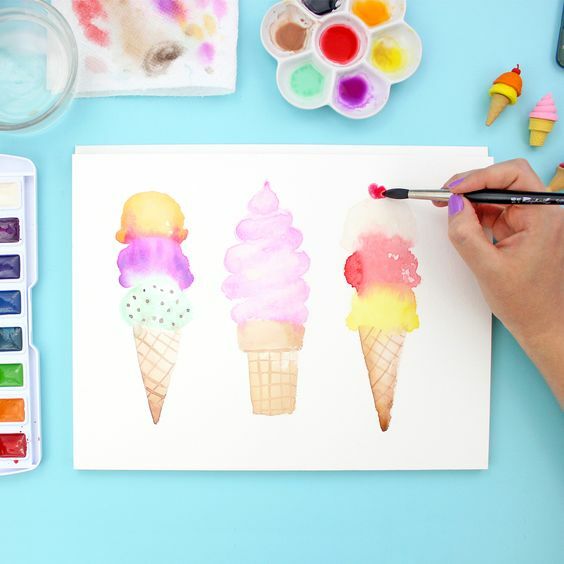 But I do adore these watercolor ice cream cones. The colors are dreamy and ice cream can’t be that hard to paint, right? It’s just round. Basically. And a triangle for the cone. 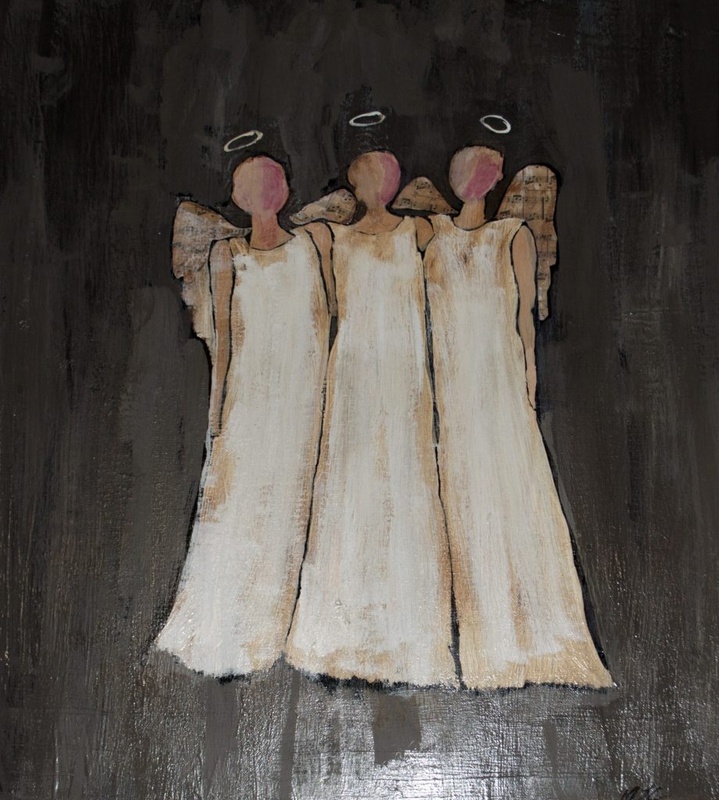 My friend Diana from Sew Very Crafty made this beautiful Christmas Angel painting. I like how here again there is the black outline and I really love the idea of trying to paint a figure. Like a human figure. I had not thought that would be simple, but this does look fairly simple. And here begins the shameless plugs for my own easy painting ideas. I made these resin and acrylic paintings earlier this year. Resin is very interesting to work with. It gives an absolutely gorgeous shiny finish. And while the mixing of the resin takes a bit of patience, this is really very easy to do. Messy, mind you, but very simple. These painted tiles are by far the most popular craft that I’ve ever posted. 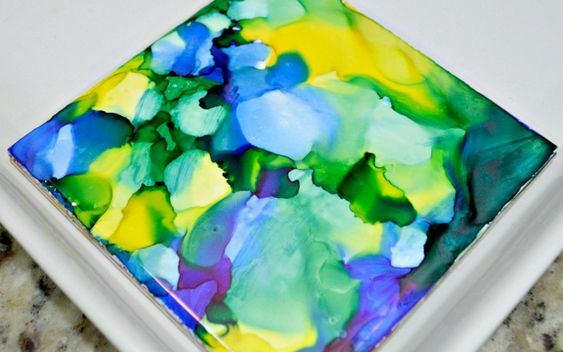 These are made with Sharpies and rubbing alcohol on a ceramic tile. They could not be easier to make. You 100% cannot mess this up. Well, you can, but it’s very easy to either start again, or fix your mistakes. I also made some super complicated wind chimes with this technique if you feel like a very much not easy project. This is not the most popular thing on this site, but I do really love this project. It’s exceptionally easy and it gives you a great opportunity to use your imagination. You can buy the canvasses from Amazon and the watercolors are fairly inexpensive, even for a good set. And there is very little, ok, zero, skill needed for this. But, it will add a very pretty pop of color to a dark corner of your home. 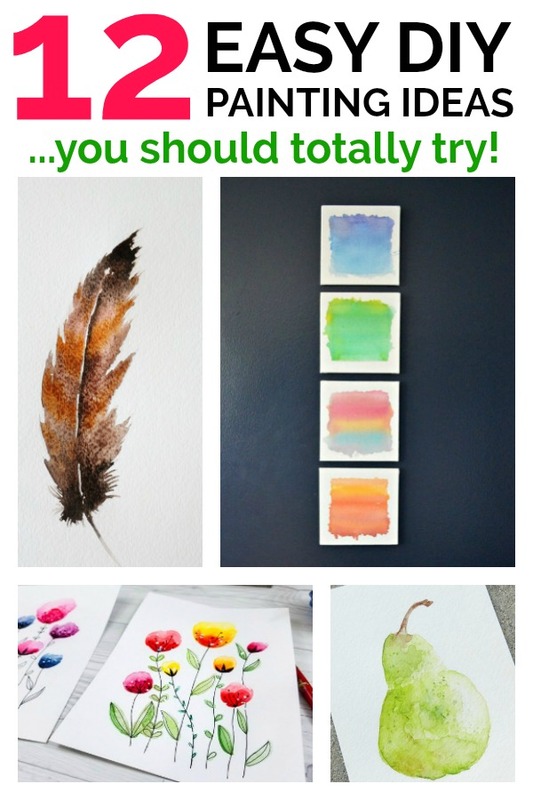 Which Easy Painting Idea to Try First? Now I have to dive in and figure which of these I want to try first? I think it’s going to be the abstract rectangles and then the feather. I’ll be sure to update you on how they came out! Which would you try? 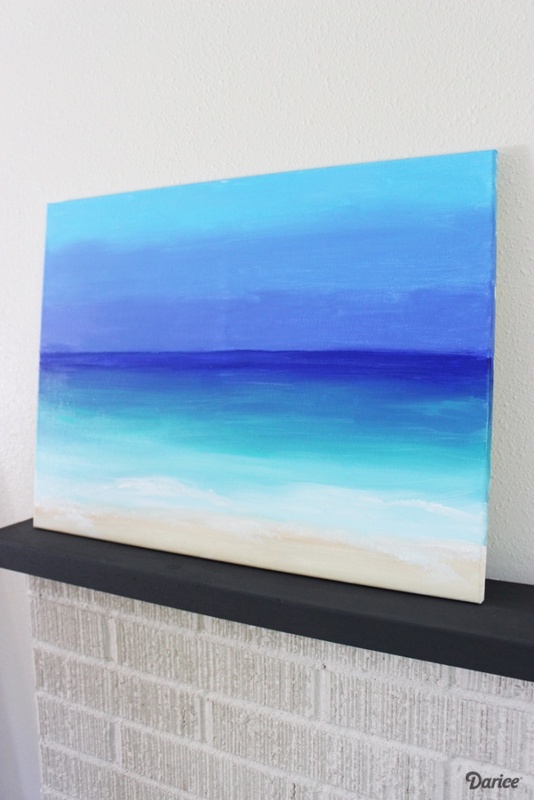 Do you have a favorite easy painting idea that I didn’t think of?? Let me know in the comments! PS! I tried my hand at watercolors! Check out this post with Easy Watercolor Painting tips to see how I did!